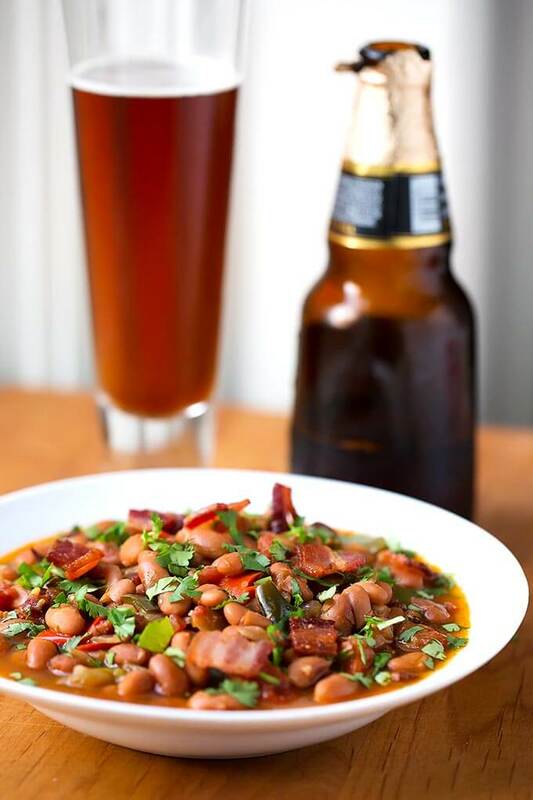 Instant Pot Drunken Beans (Frijoles Borrachos) have beer as part of the liquid, but they don’t taste like alcohol. 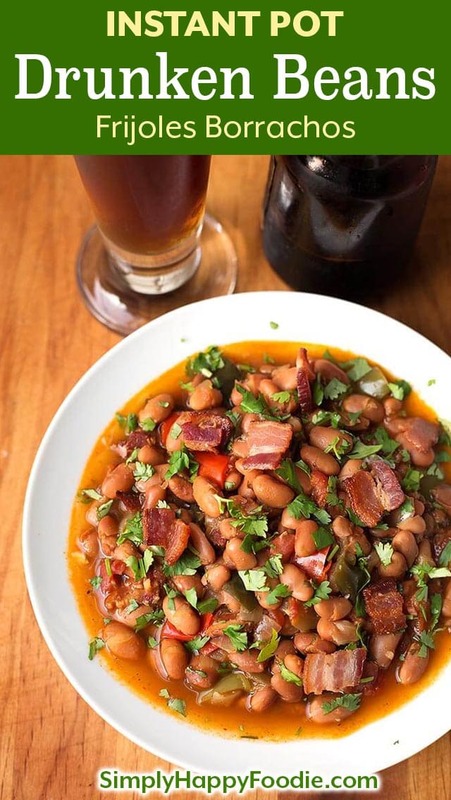 A savory blend of beans, bacon, spices, cilantro, and yes, a little beer! 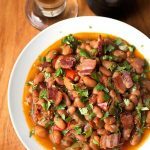 Make these pressure cooker Drunken Beans (Frijoles Borrachos) from dry pinto beans in about an hour and a half. We are eating a lot more beans these days. I used to forget to soak them overnight, and didn’t want to hassle with them. Two years ago, when I got my Instant Pot, I learned in our Facebook group that you could cook the beans from dry in under an hour! What?! Game changer. And sign me up! So that started me on a path to make all kinds of bean dishes. I mean, a meal from unsoaked beans in close to an hour? Yes please! Instant Pot Drunken Beans (Frijoles Borrachos) are one of my most popular bean recipes. 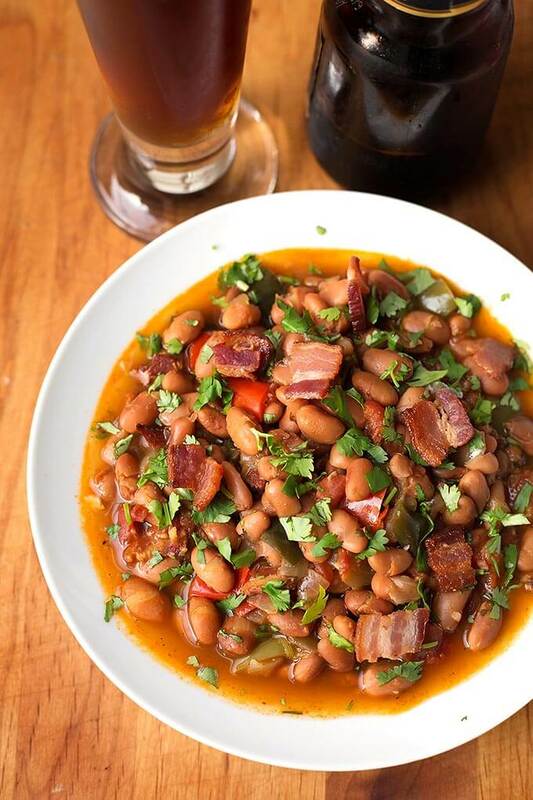 These Instant Pot Drunken Beans (Frijoles Borrachos) have a lot of flavor, and traditionally are made with bacon, beer, spices, and cilantro. They are wonderful as a side dish, or as the main course. We like to have them over rice or cornbread, or on their own, piled with toppings. Or not. Sometimes I don’t want toppings, and just want to enjoy the beans and their rich broth. And though the broth has a bottle of beer in it, it does not taste like alcohol, or like beer. 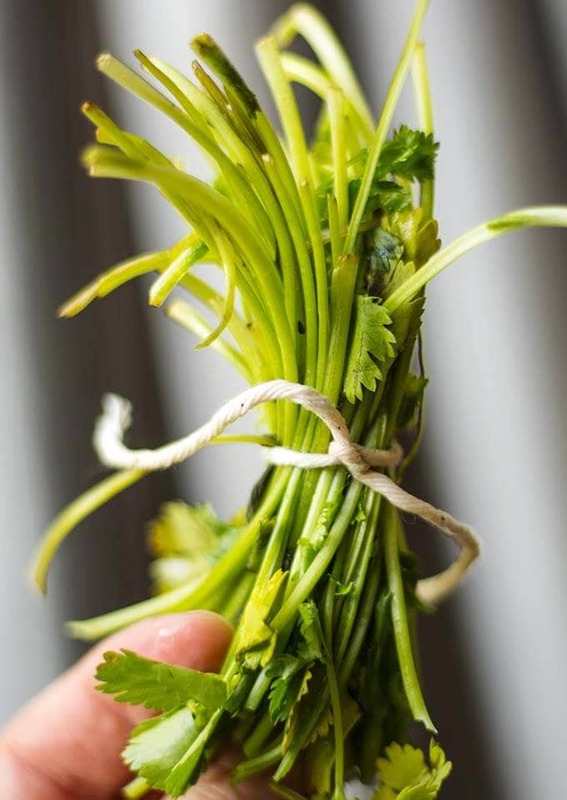 Cilantro stems have a lot of flavor, so bundle them up and tie them with butcher’s string. Then throw them in the pot to flavor the beans. The bundle is easy to fish out when the beans are done! The dark Mexican beer has a smoky note to it, and I think that transfers to the beans quite nicely, and makes them even more tasty! Plays off well against the cilantro, and compliments the bacon. 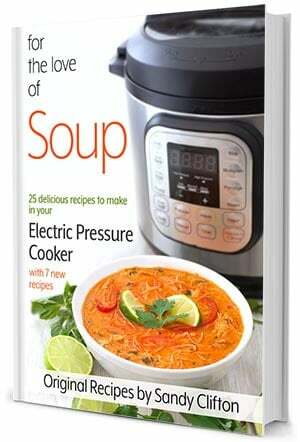 Containing 25 delicious soups you can make in your electric pressure cooker. Featuring 7 new soup recipes! Instant Pot Drunken Beans, Frijoles Borrachos, have beer as part of the liquid, but they don't taste like alcohol. 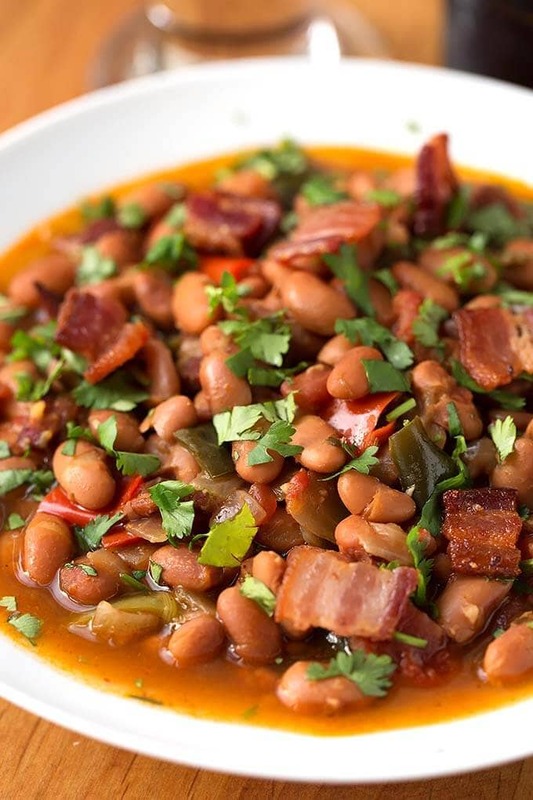 A savory blend of beans, bacon, spices, cilantro, and a little beer! (1) 12 oz Beer (Mexican dark or a Lager) or just more broth if you don't want the beer. Set the Instant Pot to the Sauté mode. When the display reads "Hot" add the bacon. Cook, stirring occasionally, until just turning crisp. Remove from pot and set aside. Discard all but 2 Tbsp of the bacon fat. Add the onion to the bacon fat and stir. Cook until it starts to turn translucent, scraping the bottom of the pot. Add the green pepper, red pepper, pasilla, and jalapeño. Stir well. Add the tomatoes, chili powder, cumin, oregano, and salt. Stir well. Add the beer, broth, bay leaves, cilantro stems bundle, and the beans. Stir well. Add 3/4 of the cooked bacon back in, reserving 1/4 of it for garnishing. Stir. Place the lid on the pot and lock it in place. Set the steam release knob to the Sealing position. Turn off the Sauté mode and press the Beans button (or Manual, or Pressure Cook) and then the + or - to choose 45 minutes. When the cook cycle ends, let the pot naturally release the pressure for 20 minutes (or longer is okay). Then manually release the remaining steam by turning the steam release knob to Venting. When the pin in the lid drops, open the pot and stir the beans. Discard the bay leaves and the cilantro stems bundle. Stir in the 1/2 cup chopped cilantro leaves. Taste and adjust salt, if necessary. Garnish as desired and serve. Drunken beans are great over rice or corn bread! *If you do soak your beans overnight, cut the cook time to 22 minutes, and reduce the broth to 2 1/2 cups. **You can use canned pinto beans. Cut the cook time to 10 minutes, and reduce the broth to 2 cups. The cilantro stems bundle is an idea I saw on America's Test Kitchen. They have many great cooking and kitchen equipment tips! Hi Giz! Just omit the jalapeño and it will be quite mild. The pasilla chile is a very mild chile, and if you want to be extra sure, just omit that, too and use the whole green pepper. My husband doesn’t like much spice, he orders 0 or 1 star at the Thai restaurant! He liked this very much without the jalapeño. Hope that helps! Take care! Yikes, read ingredient list, purchased and gathered all items listed but; salt, ground cumin, chili powder and oregano are missing from instructions! ? I added them with beer, broth and cilantro stems bundle. Cooking now, I’ll be back for a rating when they’re done. Thanks, Carol! I fixed it. Holy cow, these were awesome! I made a couple substitutions – I didn’t use the pasilla chile because I didn’t have one – instead, I got a can of tomatoes that had medium heat Chile’s in there. I also only used about 1/4 t of ancho Chile powder instead of 1 T of blend. But, both my Panamanian and my Argentinian friends said they were the best beans they’d ever had. This one is going on the permanent rotation – thanks!!! Wow Julie! That’s an amazing compliment! I’m thrilled! I have been waiting to hear feedback from somebody who has made this recipe! Thank you for taking the time to leave a review! I’m also so excited that your friends loved this recipe, too! Yay! I made these tonight for my family, and they were SOOOOO good!! I didn’t even have chicken broth or beer, so I just used water. This is going to become one of my go-to bean recipes. Thanks so much!! These were delicious! Coming from a long line of Mexican cooks, this is a huge compliment lol . I made them just as instructed with Modelo Negra beer. They were spectacular! I garnished with a dollop of Mexican Cream, Cojito cheese, a sliced avocado, cilantro and some of the bacon. Hi Evelina! I’m thrilled to know that you liked my Frijoles Borrachos recipe! This is quite a compliment, and I appreciate that you took the time to let me know! Just made these tonight and everyone loved them, even my wife who is not a bean fan. Will be making these with all my BBQ. My dish needed more time to cook. I’ll cook for 50-60 minutes next time. I had not soaked the beans. The flavor was deep and rich. Is the Pasilla Chile Pepper fesh or dried? I have dried. It is fresh, but you can soak them in hot water to soften before cooking.